4. The remaining six, if not scratch built, must be super-detailed with scratch built or commercial parts (for extra points). 2. You must earn a score of at least 87-1/2 points on six of the twelve models in either an NMRA sponsored contest or in AP Merit Award judging. When I started building models for the Achievement Programm it was natural that it had to be models of my favorite prototypes, the Santa Fe Railway and the Narrow Gauge Denver and Rio Grande Western. My all time favortite being the namesake town of Santa Fe in New Mexico with the D&RGW Chili Line departing from and ending here. To fulfill the requirements for this certificate I have to build 12!! models. 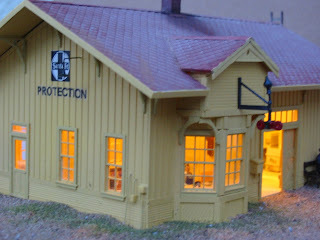 My first structure was a Santa Fe depot located in Protection, Kansas. 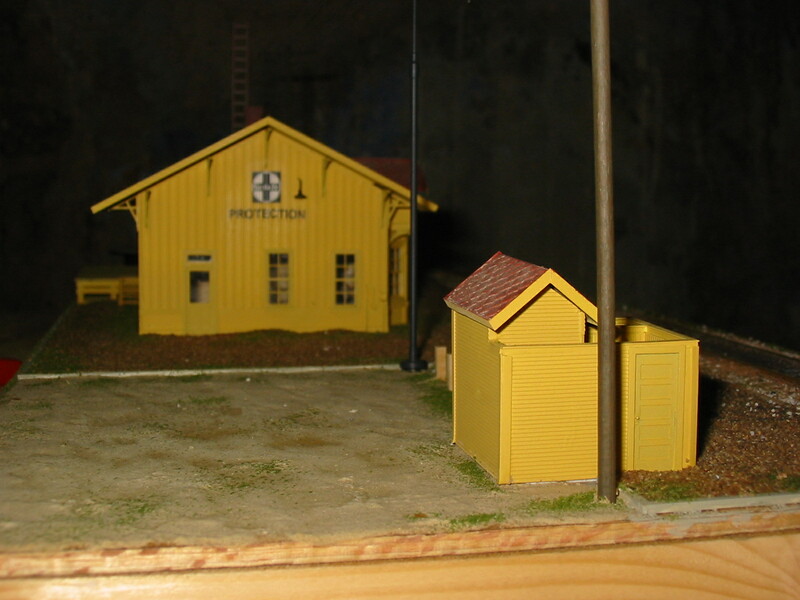 The construction article appeared in a Model Railroader article in the November 1979 issue and was written by Andy Sperandeo. I used the drawings from that article and followed the construction techniques from another article by Jay Miller, Modeling Frame Depots published in Santa Fe Modeler, January 1993. I scratchbuild the complete structure using Evergreen styrene strips and sheets. The windows, doors and several other details came from Grandt Line. I painted the depot Colonial Yellow and the roof Venetian red (that's how the Santa Fe called they colors) and did some weathering. I was very proud of my first scratchbuild structure. In the summer of 2003 I attended the National convention in Toronto, Canada. I placed it in the contest room and hoped for a good score and even a Merit Award. But usually such an overestimation of one's own capabilities is punished on the spot. The model did only get 77 points and that was 10 less than the minimum score of 87.5 points out of 125. Oh well, I thought, I will probably never succeed in the program. But then I read the notes that the judges made on the things I did well and the suggestions they made on how to increase my score. Wow! no mention of where and what I did wrong. Back home I inspected my model closely and looked for details I had omitted. I added gutters, lights, electric power meters and all that stuff that is so obvious, but never modeled. As the roof was removable I also added an interior, and boy, that made a lot of a difference. I even included interior lighting. As I did not intend to put the depot on any of my modules or layout, I created a diorama with a piece of track, platform and standard closet (toilet). And guess what? At the British Region convention in September 2003, it won a Merit Award and took 91 points out of 125. My improvements brought 14 additional points.